The Find: More good coffee for the East! Taste of Bitter Love is utterly adorable. Down the Hackney Road amoungst a rather random mix of bag shops and bargain buckets is this gem of a place. "Really really good food and coffee" is their claim.... and they totally deliver. This Hackney joint is full of yumminess. The size of TOBL will immediately draw your attention. The sloped ceiling makes it feel even smaller.... but what it lacks in size, it more than makes up for in character. 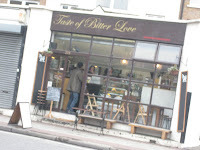 Taste of Bitter Love has an eclectic decor - school tables in the window, purple tiled floor and retro furnishings. It looks like they are straight out of a museum. The tap water in Campari bottles and their record collection are both very endearing. 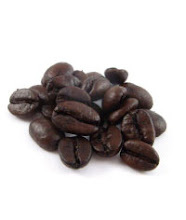 They use Square Mile Coffee. They stock Tea Pigs. Both show that quality drinks are served in this matchbox sized venue. It may be a bit of a trek into the depths of Hackney, but it's well worth a shot.